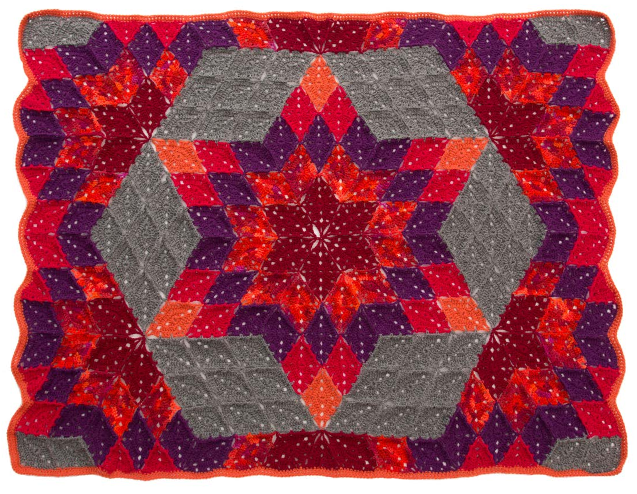 The classic desert star quilt pattern has inspired this stunning crocheted throw. 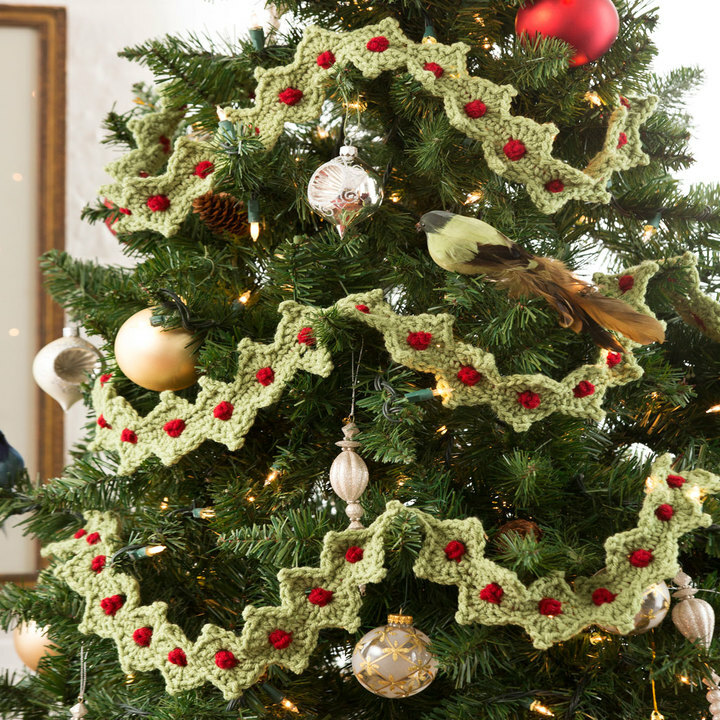 There may be a lot of diamonds and triangles to crochet, but they are joined-as-you-go and the results are spectacular! Gauge/Tension: GAUGE: One diamond motif measures about 4¼ x 6¾” (10.5 x 17 cm). CHECK YOUR GAUGE. Use any size hook to obtain the gauge. Throw measures about 54 x 77” (137 x 195.5 cm). Note: When working the border, use any of the following decreases at inner corners to help keep the edge of the throw flat. 1. Throw is made from 208 diamond motifs and 18 triangle motifs, for a total of 226 motifs. 2. Diamond motifs are worked in joined rounds with right side always facing. Triangle motifs are worked back and forth in rows. using join-as-you-go. Stitch diagrams are provided for the diamond motif, triangle motif, and joining of diamond motifs. If desired, all motifs can be worked separately and sewn together instead of using join-as-you-go. 4. 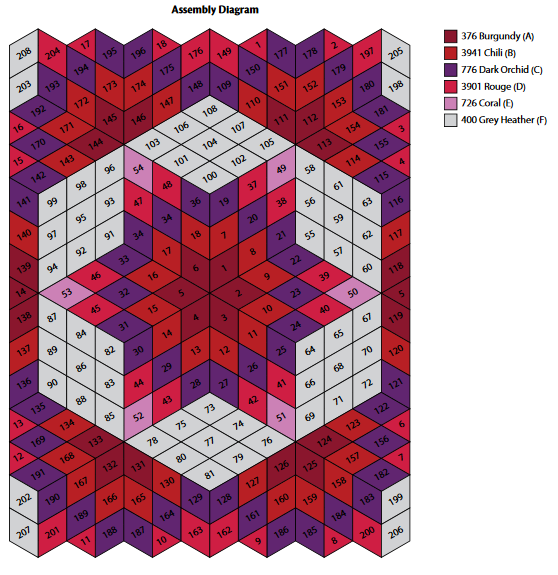 Follow the assembly diagram for arrangement and color of motifs. Make and join the center six diamond motifs first. Then work outwards making and joining the remaining motifs. The assembly diagram provides a suggested order for making and joining the motifs. But, they may be joined in any order. 5. A border is worked all the way around the outer edge of the completed throw. Round 1 (right side): Ch 1, *(sc, hdc, dc, tr, ch 3, tr, dc, hdc) in ring; repeat from * once more; join with slip st in first sc—14 sts and 2 ch-3 spaces. join with slip st in 3rd ch of beginning ch-5—28 dc, 2 ch-2 spaces and 2 ch-4 spaces. Round 3: Ch 3 (counts as dc), (dc, ch 3, dc) in first ch-2 space, dc in next 2 sts, ch 1, skip next st, dc in next 3 sts, ch 1, skip next st, (3 dc, ch 5, 3 dc) in next ch-4 space, ch 1, skip next st, dc in next 3 sts, ch 1, skip next st, dc in next 2 sts, (dc, ch 3, dc) in next ch-2 space, dc in next 2 sts, ch 1, skip next st, dc in next 3 sts, ch 1, skip next st, (3 dc, ch 5, 3 dc) in next ch-4 space, ch 1, skip next st, dc in next 3 sts, ch 1, skip next st, dc in last st; join with slip st in top of beginning ch-3—36 sts, 8 ch-1 spaces, 2 ch-3 spaces, and 2 ch-5 spaces. With A, work same as first motif through Round 2—28 dc, 2 ch-2 spaces and 2 ch-4 spaces. 1. Hold first and second motifs with wrong sides together and stitches matching. 2. Work round 3 with right side of second motif facing you. 3. As you work round 3, you will join the first side edge of the second motif to one side edge of the first motif. 4. Unless otherwise indicated, work stitches of round 3 into the stitches of the second motif. Round 3 (joining round): Join to first motif: Ch 3 (counts as dc), dc in first ch-2 space, ch 1, sc in corresponding ch-3 space of first motif, ch 1, dc in same ch-2 space of second motif, dc in next 2 sts, sc in next ch-1 space of first motif, skip next st of second motif, dc in next 3 sts, sc in next ch-1 space of first motif, skip next st of second motif, 3 dc in next ch-4 space, ch 2, sc in next ch-5 space of first motif, ch 2, 3 dc in same ch-4 space of second motif;Complete Round 3 with no further joining: Ch 1, skip next st, dc in next 3 sts, ch 1, skip next st, dc in next 2 sts, (dc, ch 3, dc) in next ch-2 space, dc in next 2 sts, ch 1, skip next st, dc in next 3 sts, ch 1, skip next st, (3 dc, ch 5, 3 dc) in next ch-4 space, ch 1, skip next st, dc in next 3 sts, ch 1, skip next st, dc in last st; join with slip st in top of beginning ch-3—36 sts, 4 ch-1 spaces, 2 ch-3 spaces, and 2 ch-5 spaces. Work same as second motif, joining first side edge to corresponding side edge of previous motif. Refer to assembly and stitch diagrams to see where to place and join each motif. Work same as second motif, joining first side edge to fifth motif and, in a similar manner, join second side edge to first motif. diagrams. CHECK MOTIF PLACEMENT ON ASSEMBLY DIAGRAM CAREFULLY. a. As you work across an edge to be joined to a neighboring motif, do not work the ch-1’s, ch-3’s, and/or ch-5’s. Work “joining ch-spaces” instead as described in b-d.
b. Instead of working a ch-1, work: sc in corresponding ch-space of neighboring motif. c. Instead of working a ch-3, work: ch 1, sc in corresponding ch-space of neighboring motif, ch 1.
d. Instead of working a ch-5, work: ch 2, sc in corresponding ch-space of neighboring motif, ch 2. 2. Use color indicated in assembly diagram. stitch diagram to see examples of joining between motifs in different locations. 4. Where more than 2 points come together, join at points by working a single crochet into the single crochet of a previous joining. With color indicated on assembly diagram, ch 4; join with slip st in first ch to form a ring. Row 1 (right side): Ch 1, (sc, hdc, dc, tr, ch 3, tr, dc, hdc, sc) in ring; do not join, TURN—8 sts and 1 ch-3 space. Row 2: Ch 3 (counts as dc), dc in first 4 sts, (3 dc, ch 4, 3 dc) in the ch-3 space, dc in next 3 sts, 2 dc in last st, turn—16 sts and 1 ch-4 space. 1. Refer to assembly diagram for placement of triangle motif. 2. Hold triangle motif and neighboring motifs with wrong sides together and stitches matching. 3. Work row 3 with right side of triangle motif facing you. 4. As you work row 3, you will join two side edges of the triangle motif to one side edge of each of two diamond motifs. 5. Unless otherwise indicated, work stitches of row 3 into the stitches of the triangle motif. of triangle motif, dc in next 2 sts, dc in top of beginning ch-3 of Row 2, ch 1, sc in next ch-space of neighboring motif, ch 3, slip st in top of beginning ch-3 of Row 2. With right side facing, join E in any stitch on outer edge. Round 1 (right side): Ch 1, work sc evenly spaced all the way around, working 2 or 3 sc at each outer point and sc2tog or sc3tog at each inner corner to keep the piece flat; join with slip st in first sc. keep work flat; join with slip st in top of beginning ch-3.